The Friends of the Norman Library have announced the group’s Annual Book Sale is moving this year from October to May, with the sale set for Friday, May 3, through Saturday, May 5, at Norman Public Library Central. 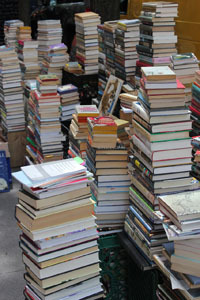 The popular yearly sale spans four rooms and features thousands of gently used books and other library materials at bargain basement prices. General sale books are priced at 50 cents for paperbacks and $1 for large paperbacks and hardback books. In addition to the general sales books in the Lowry Room, shoppers will find two rooms filled with better and collectible books, as well as children’s books inside the Children’s Story Time Room. The sale takes place from 6 to 9 p.m. Friday, May 3; 9 a.m. to 5 p.m. Saturday, May 4; and 1 to 6 p.m. Sunday, May 5 for a Bag Day Sale, where general sale books will sell for $5 a bag, with bags furnished at the door. The Collectibles and Better Books rooms will be open, and though bag sale prices do not apply, books there will be discounted by 50 percent. Proceeds from the sale go to support the programs and services offered throughout the year by Norman’s libraries. Norman Public Library Central will host a PLS Reads Book Discussion at 7 p.m. Thursday, April 11, with a guest moderator leading a talk about each of the selected books. Copies of the books will be available at the library for those attending book discussions as supplies last.